An Armful of cotton rugs, pillows and other rich accents is all it takes to turn a common space into a relaxed seaside setting. 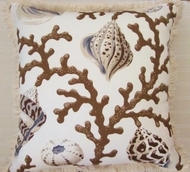 The rich brown and tan Seashell/Coral print on these luxurious cotton pillows are the perfect accent. Available in many sizes with or without trim. The small pillow is adorned with a real seashell and the oblong pillow is trim with seashells.. absolutely beautiful. Made in America.